Since our founding in 1968, the focus of Redwood Hill Farm has been on our animals, land, the planet, and people. We are committed to sustainability in the production of our Grade A goat milk and all Capracopia artisan products. Our farm has always been committed to the health, happiness, and ethical treatment of our dairy goats—and sustainability in all we do. Animal welfare is so important to us. We are proud to have been the first goat dairy in the nation to be Certified Humane® by Humane Farm Animal Care (HFAC). HFAC, an impartial third-party certifier, is considered the “gold standard” of humane certification in the United States. HFAC certification requires adhering to species-specific standards that promote and maintain farm animals’ health and happiness, allowing them the ability to engage in a full range of their natural behaviors. You can learn more about animal welfare and Humane Farm Animal Care at certifiedhumane.org. Our Sonoma County farm is solar powered. Set amidst a field of lavender and California poppies, our solar panels automatically move throughout the day, following the arc of the sun for maximum efficiency. On average, solar energy provides 100% of our electricity needs. We maintain an extensive recycling program that begins with reusing materials, then carefully reducing the need for new ones. 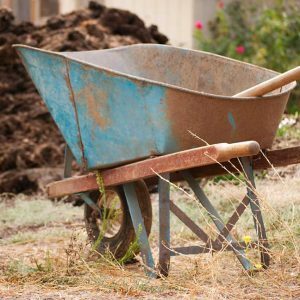 We compost barn manure and straw/hay stems and use them as mulch in the vegetable gardens, orchards and hop yard. Reclaimed water is an important part of our sustainability and used wherever it is acceptable, including cleaning the dairy floors. 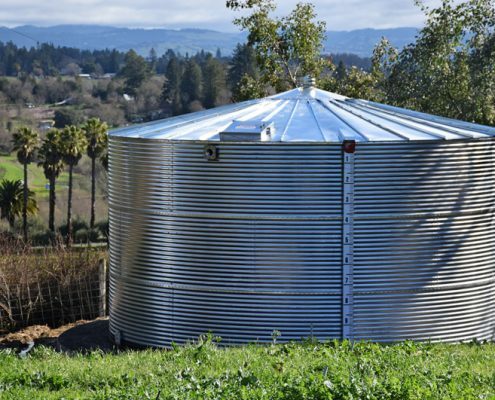 Our new rainwater catchment tanks collect about 100,000 gallons of winter rainwater for use during dry summer months. We value the dedication and expertise of Redwood Hill Farm staff members. We pay competitive wages and provide a benefit package that includes full health care for employees and their families.